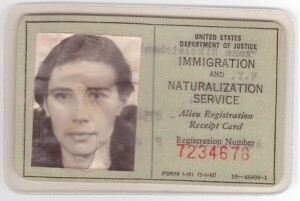 In 1972, five years after I emigrated to the US clutching my hard-won Green Card, my official status was Resident Alien. I was required to register at the Post Office every January. If I wanted to leave the country, I had to prove that my income tax payments were up to date. I had to remain “of good moral character” and could be expelled if I had a run-in with the law. And I couldn’t vote. 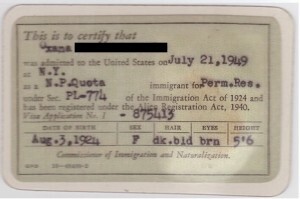 Cards have not always been green, but the name has stuck. Meanwhile, opposition to US involvement in Viet Nam was heating up. A turning point for me was the May 1970 killing and wounding of students by members of the National Guard at Kent State University, where students were protesting the secret bombing of Cambodia. As a history major, I already understood why interference in another country’s self-determination was bound to end badly. It was obvious to me as an outsider that the Viet Nam War was a disaster. Yet here in this supposed Land of the Free, it seemed that the authorities were beating up people who said so. 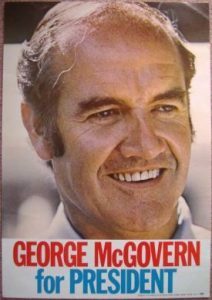 I have been sticking my neck out in other directions lately too – have become very involved in George McGovern’s presidential campaign. I have put in some time at the campaign headquarters, and then got nailed to organise the local precinct. It is really rather fun, once I got over the initial panic. Support for him is very strong in this area, so I was lucky in the number of people I could con into working for me. Our house is going to be the headquarters for all 30 Cupertino precincts Tuesday (election day), so that should be interesting too. Am meeting all sorts of interesting people, especially the out-of-state students who are travelling around working for him. There are some neat kids amongst them. McGovern won the nomination, but lost the November election to incumbent Richard Nixon. Meanwhile, I was feeling ambivalent about my own status. After five years in the US, a Resident Alien may commence the application process to become a citizen. Was I ready to do that? Could I turn my back on the land that had nurtured me and my ancestors? Could I pledge allegiance to a country whose foreign incursions I could not support? On the other hand, how badly did I want to share with my neighbors in making decisions about this place we all now called home? For most immigrants, this is a decision that requires careful thought and soul-searching. In the end, my husband and I decided to apply for citizenship. We didn’t know then how many years, frustrations and phone-calls it would take. But that’s another story. A friend of Tony’s from Memorex came to dinner. A Korean boy … He is really charming, and we had a pleasant evening. One interesting thing that came out of it – Yun also reads and writes Mandarin Chinese, so was able to translate the inscription on our sparrow picture for us. Do you remember our sparrow? 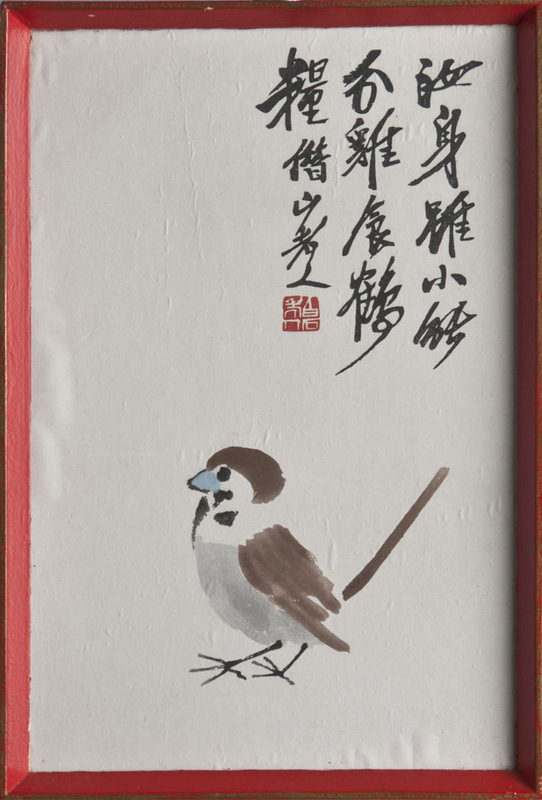 It is a little brush drawing that Tony picked up in a junk shop in Hawera when he was a student, shortly before reading in a magazine a story about a famous Chinese artist who was objecting to a government campaign to kill off the sparrows to improve the wheat production. 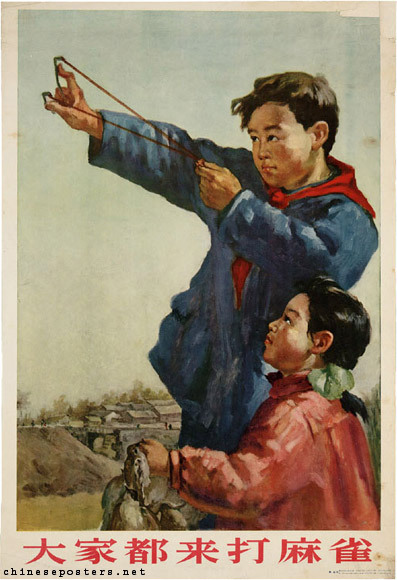 He made these little posters, inscribed with sentimental stories about the sparrow. And this, as far as we can tell, is what we have got. With the help of the Internet, I’ve been piecing together my fragments of knowledge about this period in Chinese history. What I discovered is a familiar story about well-intentioned interference with nature leading to ecological disaster. In the First Five-Year Plan of the newly-founded People’s Republic of China, families were each given their own plot of land. 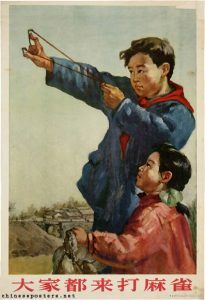 In the Second Five Year Plan, begun in 1958, a new agriculture system was announced. Family farms were grouped into collective farms, making each village a single production entity in which everyone would have an equal share. Food would be provided in a communal kitchen. In theory, a collective farm where resources were centrally controlled should be more efficient and yield higher productivity. In practice, agricultural production figures fell. Food shortages were exacerbated by flood and drought. Believing that getting rid of sparrows, who ate grain, would improve production, Chairman Mao Zedong launched the Four Pests Campaign, which encouraged citizens to kill them, along with three other pests: rats, flies, and mosquitoes. Sparrow nests were destroyed, eggs were broken, and chicks were killed. Many sparrows died from exhaustion; citizens would bang pots and pans so that sparrows would not have the chance to rest on tree branches and would fall dead from the sky. 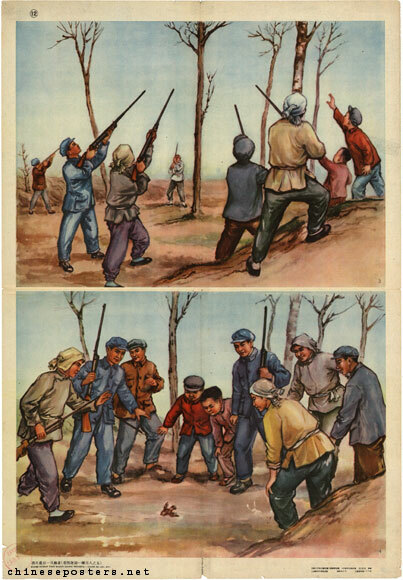 Citizens also shot the birds down from the sky. These mass attacks pushed the sparrow population to near extinction. In hindsight, the result was inevitable. Too late, Chinese leaders realized that sparrows didn’t only eat grain seeds. They also ate insects. 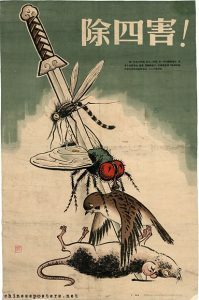 With no birds to control them, insect populations boomed. Locusts, in particular, swarmed over the country, eating everything they could find, including crops intended for human food. People, on the other hand, quickly ran out of things to eat, and tens of millions starved.